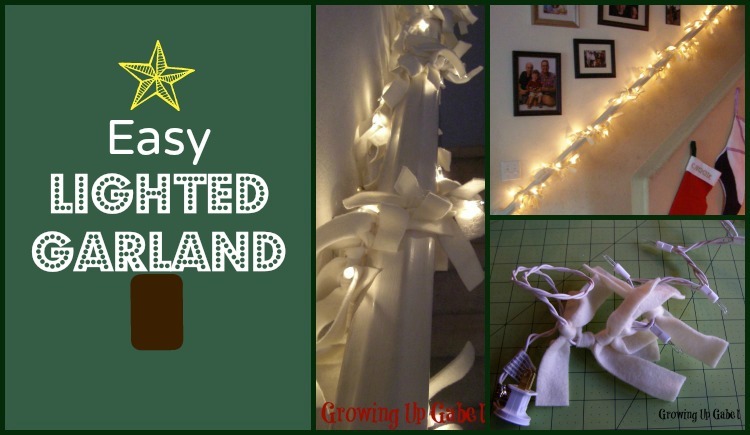 This adorable and easy lighted garland is quick to make and beautiful to hang. 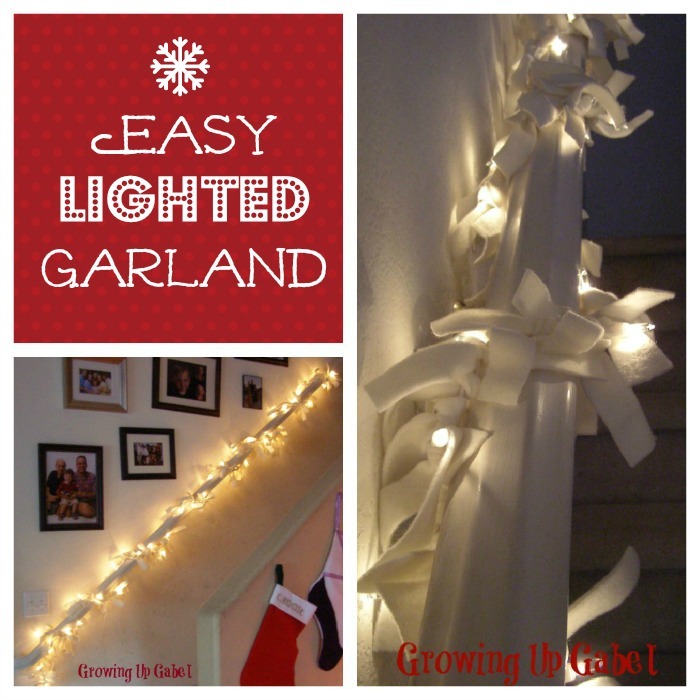 The lighted garland uses a simple strand of lights and strips of fleece to create a cozy garland perfect for your mantle, staircase or tree. I saw this garland on my friend Wendy's blog, Wendy's Hat and I fell in love! I had been eyeing her Christmas wreath made with fleece strips but when I saw the garland, I knew I had to make it. I have a banister that runs up my staircase and it was feeling a little lonely without any Christmas decorations and I knew that this lighted garland would be perfect for it. I was thinking of doing a red and green garland, but then I dug through my fabric stash and found a small strip of ivory fleece. So that was that! I found lights on white cords at Target for $2.49 and picked up another 1/2 yard of ivory fleece. I began by using my Christmas gift from my husband – a brand new rotary cutter and board! It's my first rotary cutter and I love it! 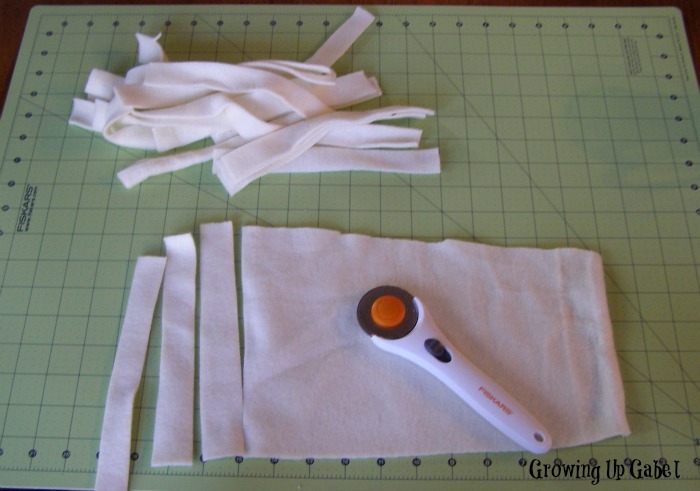 I cut my fleece strips roughly 1″ x 8″ as Wendy suggested, but I wasn't very accurate. Some strips were closer 6″ long and others were 10″ long. So don't sweat it if you have a little less or more. Then I just started tying the strips on to the strand of lights. 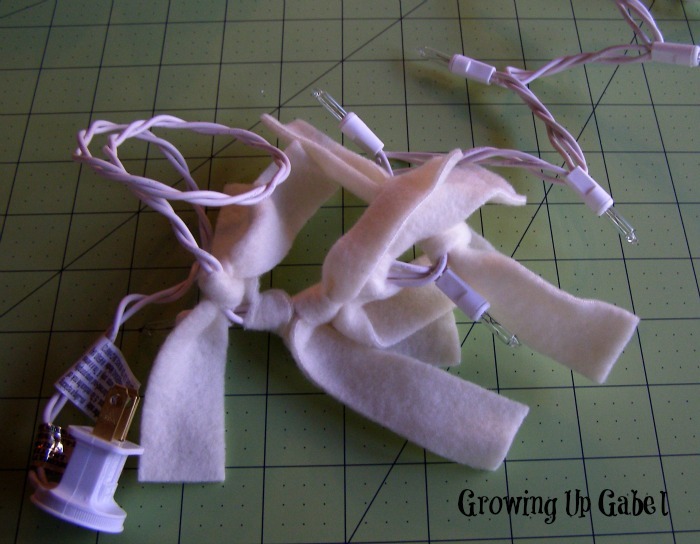 I did three fleece strips, more or less, between each bulb. It only took me about 20-30 minutes total to get everything cut and tied on. 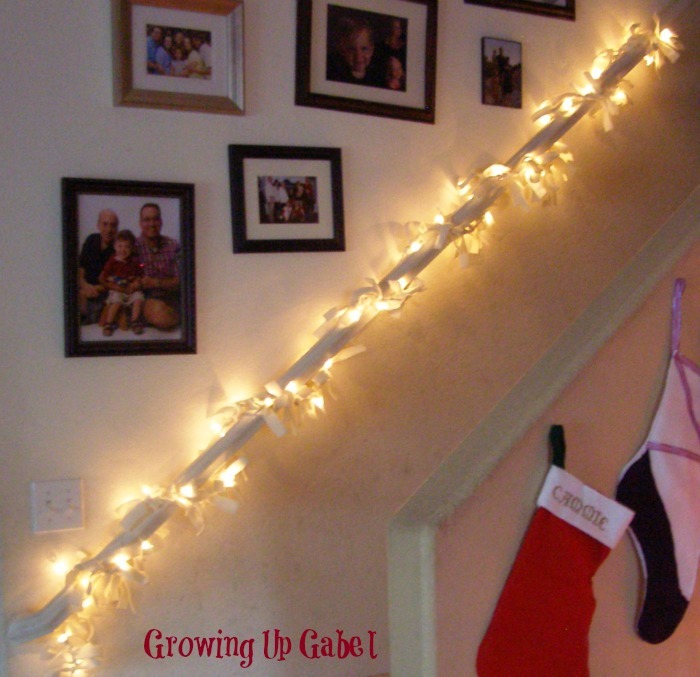 I wound the lighted garland up my banister and voila – instant coziness. My daughter says it looks like snow, which is pretty much near perfect for a 6 year old dreaming of a white Christmas in the desert! And now I have to go straighten the crooked photos on the wall! Sheesh! Oh wow! How did I miss this?!?! You made one! I love it. 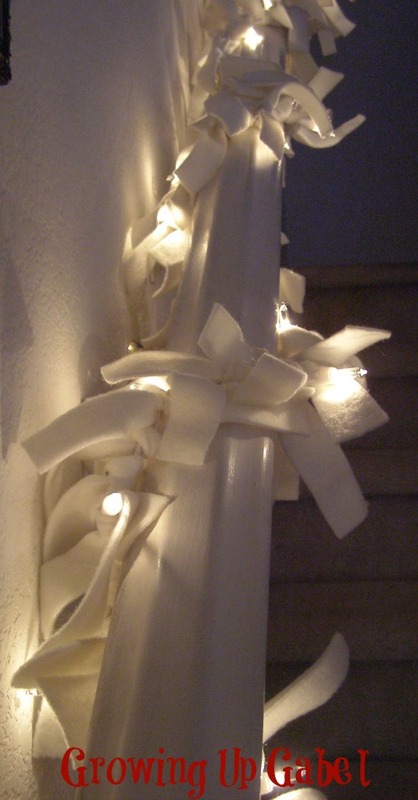 This garland looks perfect on your stairs too! Thanks for the mention. Was it addicting to make like it was for me? I ended up making garlands and wreaths for others after I made mine. Yes! I love making them! 🙂 Kinda therapeutic. Wow, love it! It looks fabulous and I am totally crushing on how you no longer have to worry about bunched up lights in one spot or keeping them “even”. Ha ha! Yes! Thanks, Christine! What a neat idea! love the white!